The Hungarian government has announced that the installation of a controversial monument which critics say glosses over the country's active role in the Holocaust will be postponed until after the general election. The monument, to be unveiled as Hungary marks the 70th anniversary of the start of mass deportations of Jews when the Nazis took power in 1944, will also be renamed, according to a statement. It will no longer be "dedicated to the memory of the German occupation" but to the "victims of the German occupation", and will be inaugurated on 31 May 2014 instead of 19 March, the anniversary of the German occupation of Hungary in 1944. Hungary was a close ally of Hitler Germany during World War II, and Hungarian authorities were complicit in sending hundreds of thousands of Hungarian Jews to the death camps. 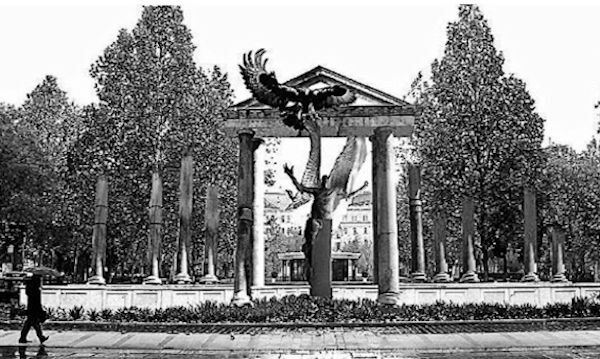 The planned monument depicts Hungary as an angel being attacked by a German eagle, which critics say absolves Hungarians of their role in sending some 450,000 Jews to their deaths. The country's Jewish umbrella organization Mazsihisz had decided it would not take part in official activities marking Holocaust unless the sensitivities of Shoah survivors would be taken into account. The World Jewish Congress supported Mazsihisz' decision, and WJC President Ronald S. Lauder wrote in an opinion article published last Saturday in the newspaper 'Népszabadság': "If Prime Minister Viktor Orbán and the Hungarian government seriously believe that the statue should also be a memorial for the Jewish victims, at the very least they should listen to the Jewish community's concerns, take them into account, and reconsider their plans." Lauder also warned that the issue of Holocaust remembrance was being dragged into the election campaign. "Extreme-right forces must not be allowed to exploit this issue for electioneering purposes. The remembrance of the Holocaust and of the atrocities committed during World War II ought to unite Hungarians, not divide them," the WJC president wrote. 'Népszabadság' reported on Thursday that Orbán will write a letter to Mazsihisz urging the community to attend the commemorations. The paper said the government wanted to avoid aggravating the situation before legislative elections on 6 April 2014.